Pancreatic cancer, a silent killer? ‘Middle-class’ Joe Biden hits the trail for Dems, but will it win back working-class voters? Add Joe Biden as an interest to stay up to date on the latest Joe Biden news, video, and analysis from ABC News. Joe Biden may be playing coy on his rumored presidential run in 2020, but the former vice president has been anything but in the lead-up to the November midterms. Biden has been traversing the country to campaign for Democratic candidates hoping to be a part of a so-called blue wave to sweep the midterms. An aide to Biden told ABC News that he plans to focus on areas where Democrats can pick up potentially vulnerable red seats or hold on to key seats they already hold. Since Labor Day, Biden has campaigned in Pennsylvania, Michigan, New Jersey, Rhode Island and California. He headlined two rallies in Kentucky and Indiana on Friday alone. 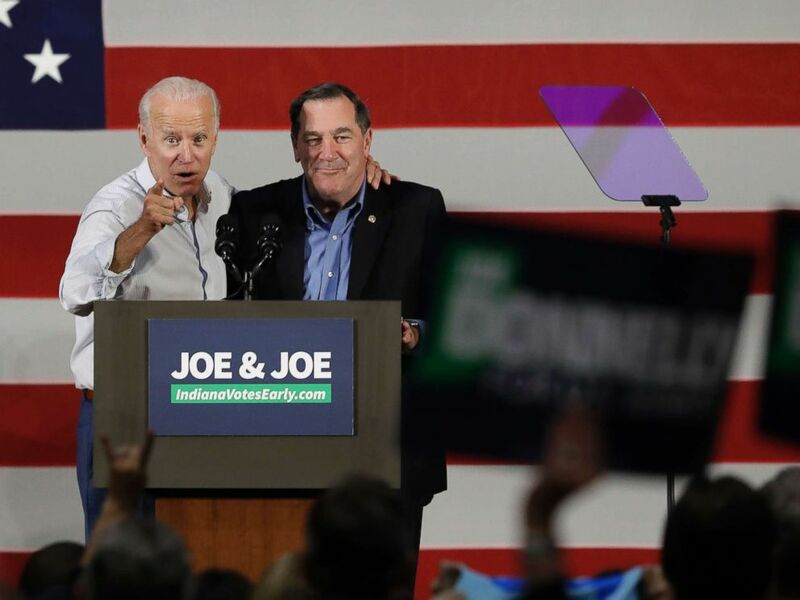 Former Vice President Joe Biden, left, and Democratic Sen. Joe Donnelly speak during a rally, Oct. 12, 2018, in Hammond, Ind. Biden’s appearances Friday with two red-state Democrats could be an indicator of Biden’s unique appeal in the Democratic party as a politician who can win over blue-collar voters — a bloc he believes Democrats will need to win back the White House in 2020. “We can’t possibly in my view win the presidency unless we can begin to reclaim those white working-class voters that used to vote for us,” Biden told the New York Times in an interview after his rally in Kentucky. In his remarks in Kentucky and several other campaign stops, Biden has talked about his understanding of working-class values from his own upbringing and his decision not to invest in stocks, bonds or business venture to avoid being influenced by money. “I know, as I said, that I’m called middle-class Joe. It’s not meant as a compliment — it means I’m not sophisticated. That’s been my handle for the last 40 years. But I know what made the country what it is: ordinary people doing extraordinary things,” Biden said to a large burst of applause Friday. His remarks at campaign events focus on solutions for the middle class — as well as drawing a sharp contrast with President Trump. Former Vice President Joe Biden speaks during a campaign event for Kentucky democratic congressional candidate Amy McGrath in Owingsville, Ky., Oct. 12, 2018. 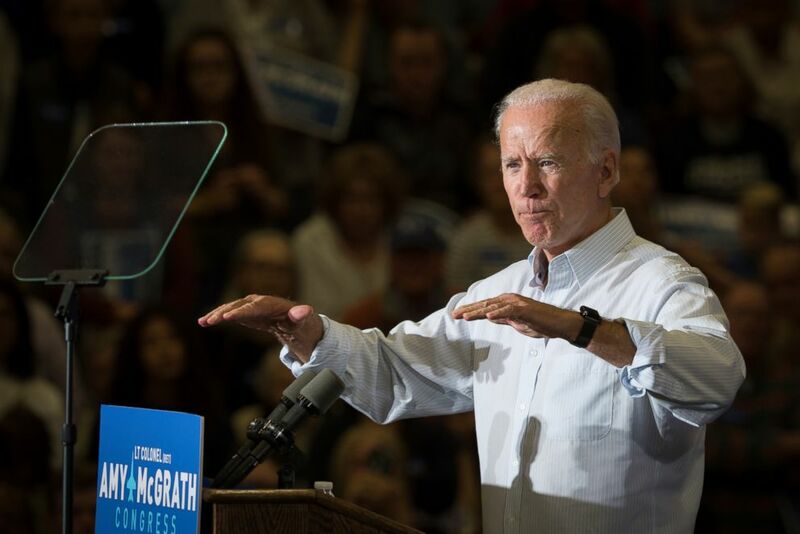 In Bath County, which is nearly 97 percent white, the majority of which do not have a bachelor’s degree, Biden drew a crowd of more than 2,200 people while campaigning with Amy McGrath for Kentucky’s 6th district. “I do think he’s going to build up some excitement and get more people out to the polls that may have been just not really paying much attention, and who maybe don’t vote in congressional elections,” said Jennifer Wells-Hosley, who came from Lexington to hear McGrath and Biden speak. Biden urged attendees to have an optimistic outlook about Democrat’s prospects in the midterms. “I predict to you that Democrats will win 40 seats in the house, and I predict to you there is a better-than-even chance that we win the Senate,” Biden said in a London speech Wednesday. What remains to be seen is how effective a counter Biden could be to President Trump in the midterms. The two, who have engaged in tough talk in the past, stumped for candidates in Kentucky’s 6th district — one of the most closely watched races of the midterms — within a day of each other. While Biden was focused on ginning up the vote for McGrath in Kentucky, the crowd was already looking ahead to 2020, chanting “Run, Joe, Run” when McGrath praised him for coming back to the campaign trail after leaving the White House. The possibility of hearing a 2020 candidate was a motivating factor for some in the crowd. “I don’t care as much if someone is a political outsider because I do think that experience in policy is important,” Harder continued. Biden said Wednesday he is not a candidate for 2020 “at this point,” but will make a decision about a possible run by January.